If you have spent any time either here on the blog or with me in person you will know by now that I am a bit of a coffee fanatic. Being a self confessed caffeine junkie and working in social comms means that I am somewhat wedded to places like Starbucks to give me that fix on a day to day basis. I would like to point out that it is not because I think there coffee is the best - far from it (for that try Joe and the Juice on Regent St, or Kaffeine), but the fact that you can always find one, order the same thing and get the same drink (most of the time) and access free Wi-Fi ticks most of the boxes for me. But I am also drawn to Starbucks for another reason - their clear understanding of how to capture the hearts of their consumers. If you have ever interacted with their UK MD on twitter, "Liked" a photo on their Facebook page, checked in at a store or submitted a "My Starbucks Idea" you know what I am talking about. Starbucks have recognised that getting people to recommend them is of the utmost importance, and they are seeking to find new and exciting ways to do that everywhere they go. This was exemplified to me first hand this weekend at the London Coffee Festival in the far to trendy Truman Brewery in Brick Lane, where along with some of the best food and coffee on the planet, Starbucks asked me to share "My Starbucks Moment" Through the use of a photo-booth provided by the fantastic people at Say Fromage. 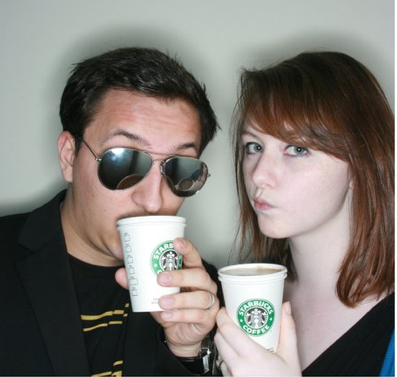 After sampling a free Cake Pop and Flat White we were ushered into the photo-booth (cups in hand) to take a photo - from there we could print it out, leave a caption and post it on a photo wall on the stand, but crucially upload direct to Facebook into a newly created album "My Starbucks Moment" or email to a friend. A simple, yet devilishly clever tactic, but says clearly that Starbucks understand the DNA of a recommendation very well. Giving punters the opportunity to capture the moment of the festival as it happens, creating something to direct others to, adding a narrative to that moment - and a branded narrative at that, but also finally understanding that the association that fans of Starbucks have with the brand and giving the opportunity to share that association through a piece of content. Capturing hearts and minds in a moment, but creating recommendations that last a whole lot longer.